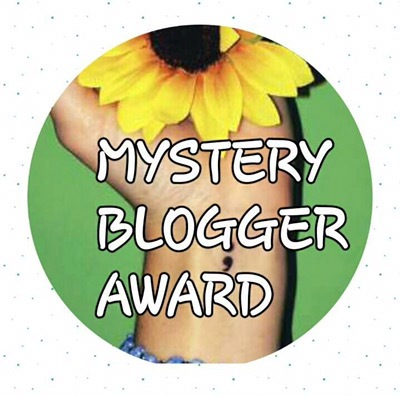 In the Garden – A Fragile Stretch – Misty Meadows Homestead & more! Last time we talked, we were in the process of starting vegetable plants from seed and I was trying to convince you how very easy it is… and fun! This time we are going to talk about what to do if the stems of your seedlings are looking fragile, skinny, stretched out and downright lank and “leggy”. 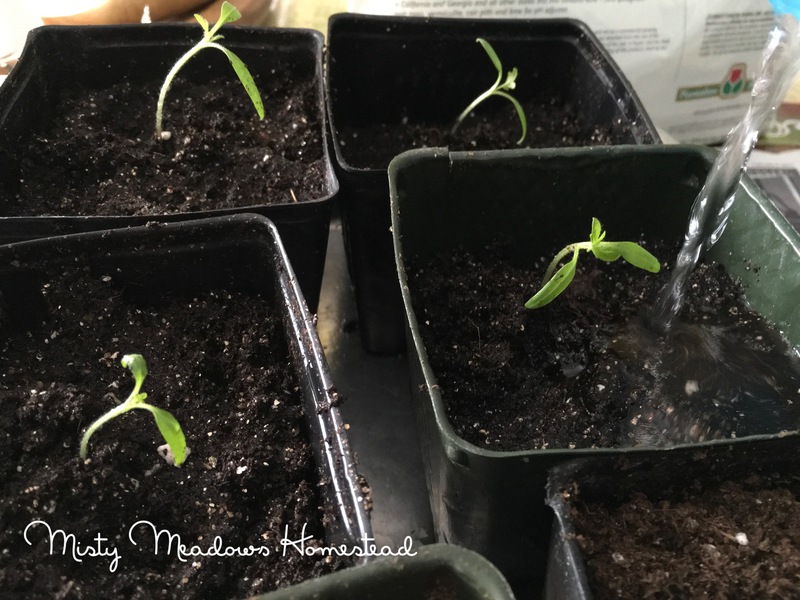 Several weeks ago we performed a germination test on some older tomato seeds. The majority of those seeds germinated; rather than toss them, we planted them and even though they have resided in our sunniest window, as you can see, they are getting leggy. This is normal – for its survival, the little seedling will grow toward the light; since the light currently available is too far away, the plant has accelerated its growth in an effort to get closer to the light, thus making it leggy. To prevent this, especially in the northern reaches of the country where we are still only getting about 10 hours (or less) of light a day, you may find you need to use a grow light. dry soil will cause them to not grow properly. If your seedling is getting adequate light, warmth, and moisture and not getting leggy, you won’t need to repot it until you either see roots on the surface of the soil or see them coming out the drainage holes. Repotting is a bit of a messy project; I had originally planned to do it outside, on the deck, but the past few days have been very rainy here in Western Washington. As I write this from my desk, I’m looking out the window where the weather keeps switching between rain and snow, with rain winning at the moment. This truly has been a much different year than last. I’m left pondering how the differences will impact the coming grow season. Gather your materials (pots, potting soil, something to label the pot with, butter knife or something to help you gently pry the start out of the pot). Water the seedlings well. Moist soil won’t cling to the sides of the pot making removing the seedling easier and it will also protect the roots from drying out. Be gentle! Don’t tug or pull the tender plants from their flats or trays. Use a butter knife, popsicle stick or something similar to coax the seedling from its container. If there is more than one seedling in a container, carefully separate them and repot individually. Place the seedling in a new pot, fill with soil and gently tap down the soil. Label the pot with the plant name. Water well. 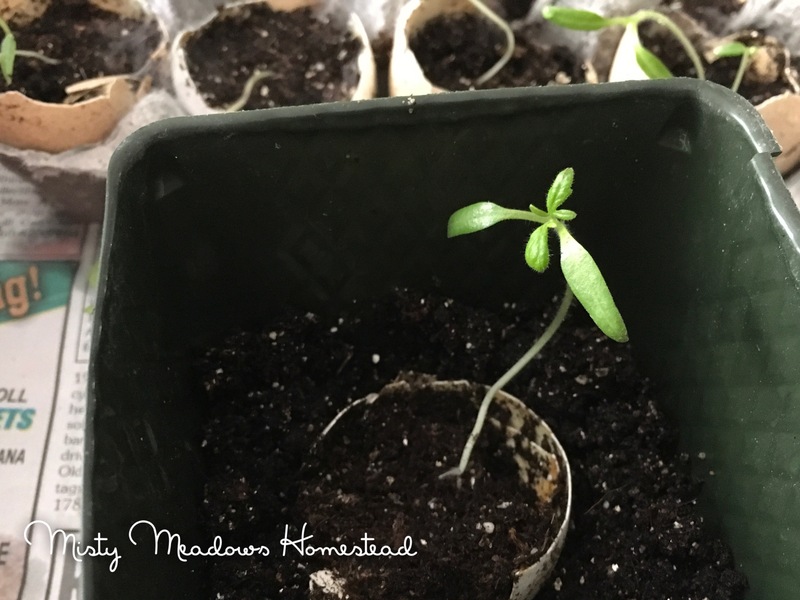 Wait a few days until the seedling settles into its new home before using any fertilizer and even then it should be diluted to prevent root burn. Here’s how we did it. We’ve included a few tips to make your experience more enjoyable. Before we start transplanting, we like to sterilize our pots in a bucket (in this case, a repurposed, clean kitty litter bucket) of hot water that has been treated with a splash of household bleach (UC Davis Extension suggests 1 part bleach to 9 parts water for sterilizing all your gardening equipment). We allow the pots to soak about 30 minutes before using them. Since we are doing this inside, the table is covered with newspaper to make cleanup easier. If you started your seed in an eggshell, you don’t need to remove the seedling from the shell, just repot it along with the seedling. We like to crack the shell to make it easier for the roots to grow through it. 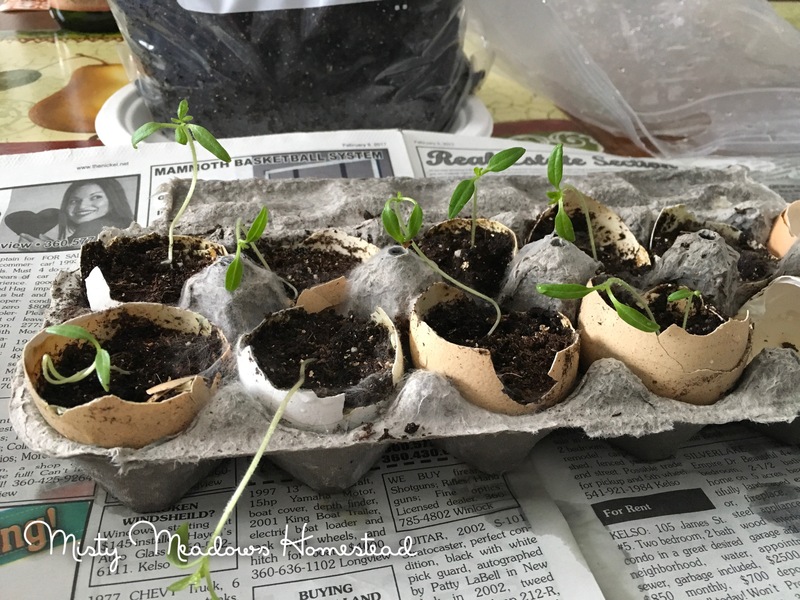 It’s pretty much the same if you use newspaper pots, egg cartons, cardboard paper rolls – it can all planted with the seedling and will eventually breakdown in the soil. Because these seedlings are leggy, we’ve planted them deeper than we would normally – about 2/3 of the stem is under the soil. Some will tell you to toss them and try again. It seems like such a waste of time and resources to do that. If you have seeds left over and the time, you can certainly try again. Since these are tomatoes, which have an amazing ability to grow roots out their stems, we’ve opted to repot them. Fill the pot with soil, gently pack it down and water well. That’s it. If you have a grow light system, keep using it. You want the light about two inches above the seedlings and moving it as the seedlings grow taller. Doing this will ensure they don’t get leggy. Have you checked out our Garden Journal, yet? 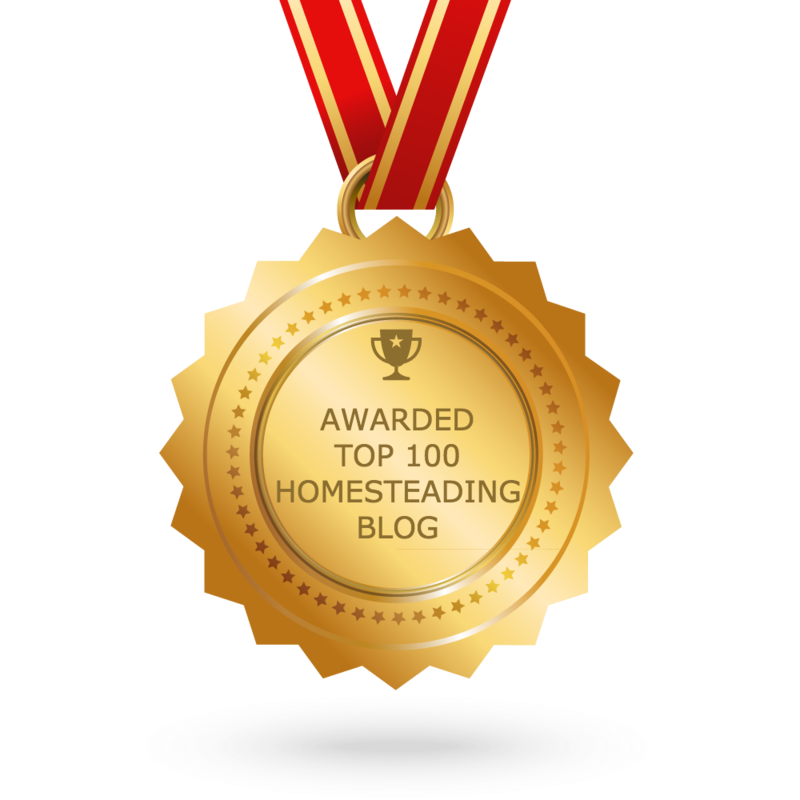 It’s a great tool to help you minimize your failures and maximize the fun and success you have in the garden! Order today and get started on your best garden season yet! 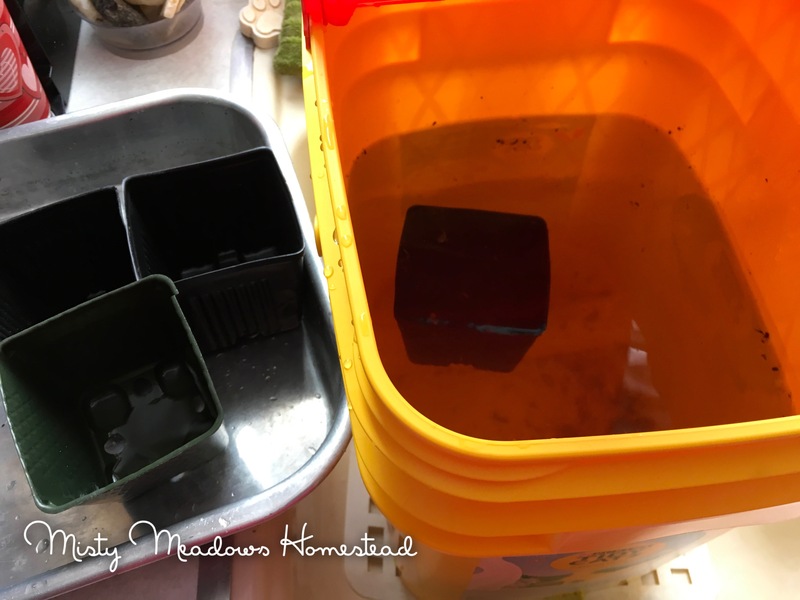 Do you sterilize your soil or your pots? Have any tips? Leave them in the comments below. Would you do us a favor and “Like” it? We would love to follow you back, just leave us a message you have “Liked” us and the link to your site. I’ve also found that peppers get leggy if the heat mat used for germination is left on afterwards. No idea why. And broccoli always goes leggy if I don’t transplant it really quickly. Really? I’ll have to watch for that. Thanks!! Because I live in the southeast where the summer is long and hot, I don’t start my flower seeds until it’s almost warm enough to put them outside for their light allotment. There will be plenty of summer left for them even with a late start! 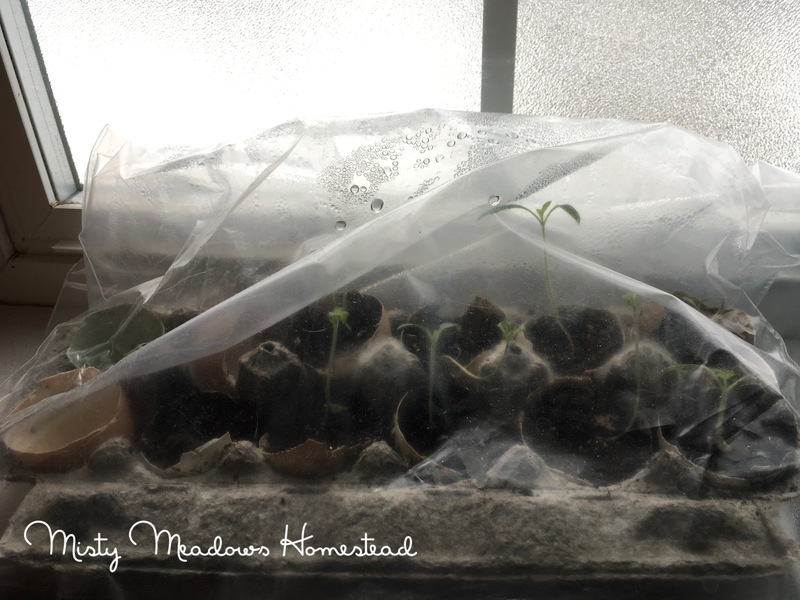 (My house is too cool in the winter for good germination and all my southfacing windows are in busy parts of the house so not great conditions for seedlings.) This is why I buy my tomato plants, etc. from a greenhouse… When I read the seed catalogs it makes me want to start seeds instead, though. I read your article with interest because one of these years I am going to get a growlight and probably a heater so I can start them in the cold basement. Thanks for some good ideas! I don’t know if my seedlings will grow successfully, but I’ll give this great idea a try. Thanks.